Graphic Systems Manager, Rajesh Claplot poses with the Gold Award won by the company. Less known rural based company beats renowned Kampala companies. Who is James Finlays? This is the question that many guests attending the 6th Employer of the Year Award ceremony in Uganda seemed to ask themselves as James Finlays (Uganda) Ltd, a rural based tea company, was announced the overall winner of the 2006 Employer of the Year Award in Uganda. There is no way corporate big shots, employees and employers from hitherto more recognisable companies in Uganda as well as international employers' federations like the Chinese Enterprise Confederation and the Confederation of Norwegian Enterprise could have guessed this year's winner right. Neither could Daniel Ojara, the James Finlays representative at the event. 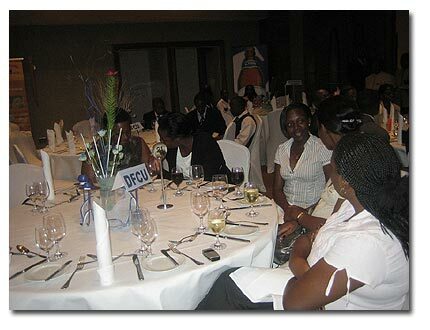 He could not believe his ears when his company's name was announced during the award ceremony at Kampala Sheraton Hotel Ballroom on April 24, 2007. 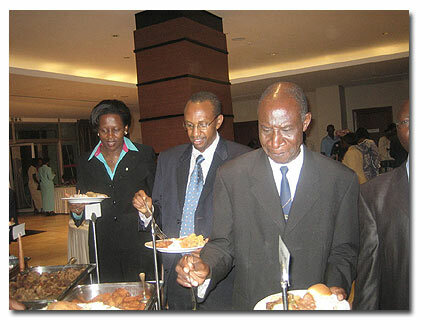 Ojara, who was sitting with Ugandan business news reporters at the back as he enjoyed his drink, immediately donned a surprised look. It took him at least 15 seconds to stand up and walk to the podium to pick the company's accolade. This was not the only unusual thing that happened because the crowd took another at least six seconds before they could recover and rise up to give applause to Uganda's Best Employer, 2007. The name James Finlays (U) Ltd is not familiar to the majority of Ugandans. The tea producers, with estates in Bushenyi, Kabalore, Kyenjojo, Hoima, and Kabale districts and an annual production of about 11 million kilograms of tea, beat all the known big names to take the annual award run by the Uganda Federation of Employers and received a certificate and evaluation report about the company in addition to the "Platinum Accolade". Murmurs from some jealous people could not change the decision made by Aikan Development Consultants, who selected the winner using national indices during their human resource evaluations in the first time this method was used in Uganda. Speaking of the award, Ojara, who doubles as James Finlays' Human Resource Manager and Administrator, said the award represented the beliefs of the company's employees. "These are the responses of our employees because they are the ones who participated in the survey. They spoke about what is happening in the company and we have been rewarded with this," Ojara said as he displayed the accolade. He said that the award would motivate the company's management to put into practice strategies that will produce more value and motivate staff for better results in the future. "The best word to describe this moment is speechless. I am short of words," he said, amidst cheers from the people in attendance. British Council's Information and Business Relations Manager, Ann Babiraga with James Nkambwe the assitant resource officer of British Council after winning the award. The British Council's country Information and Business Relations Manager Anne Babiraga, whose organization came third to earn the 2nd Gold accolade could not hold back the smile. Babiranga said that when they received the Bronze Award last year, they carefully put into practice the recommendations in the accompanying report. "That is the magic," she said as she left the podium. Other awards included 1st Gold that went to Graphic Systems (U) Limited and the Employer of the year award for the Silver Category which went to Entebbe Handling Services. The bronze category (classified into 1st, 2nd and 3rd) went to Africa College of Commerce, Kasese Cobalt Company Limited and Kabale Trinity College respectively. Other organizations that were recognized are African International Christian Vocational Training College in Kabale which excelled in the category of Recruitment and Selection, Shell Uganda which excelled in occupational health safety and environment, World Vision and Kampala Serena Hotel which did well in best Human Resource Role and Performance. The Mild May Clinic excelled in HIV/AIDS Workplace Policy, Midraw Private Sector took the Northern Region award and Manafwa High School could not be outmatched in the Eastern region of Uganda. The awards in the categories of the Western Region, Training, Learning and Development, Communication, Performance Magic and Employee Relations were left out because the participating firms failed to meet the required standards set by the Federation of Uganda Employers. "We could not give out the awards in these categories for the sake of awarding awards. We needed firms to qualify for them, so we are not giving them out this year," it was announced. This year's awards were held under the theme "Achieving competitiveness through people." The Awards were sponsored by Celtel Uganda, Citigroup, Sheraton Kampala Hotel, DFCU Bank, International Hospital Kampala, Nile Breweries Limited and Century Bottling Company (Coca-Cola) and focused on human resource towards achieving organizational goals. Minister of Gender, Labour and Social Development Syda Bbumba. 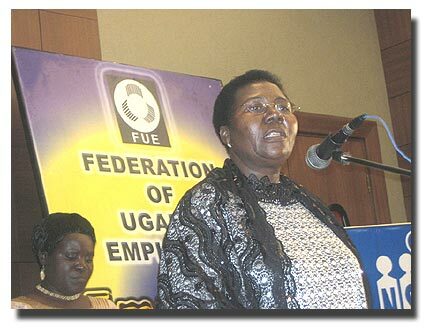 In her remarks, the chief guest, who was the Minister of Gender, Labour and Social Development Syda Bbumba, commended the Federation of Uganda Employers for conducting the awards and recognizing good employers. She requested the employers to make sure that they comply with the labour laws prevailing in Uganda as a way of improving the productiveness of their employees. Bbumba also warned that employers who deny their employees the right to associate would face the wrath of the law if proven. She called for improvements in the quality and capacity of indigenous employers to be able to meet internationally accepted standards. 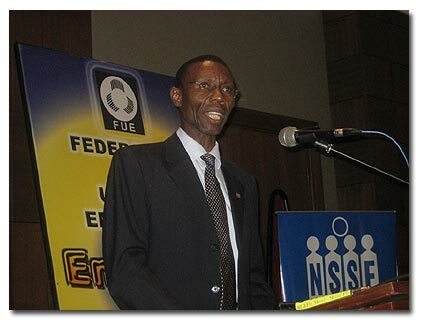 The Chairman of the Uganda Federation of Employers, Engineer Martin Kasekende, said the federation introduced the awards in 2001 not to act as a prestigious award to be won but rather as a learning experience to encourage Ugandan enterprises to improve their human management practices as a strategy to achieve improved performance. "The Federation of Uganda Employers is committed to enhancing the competitiveness of its member organizations and believes that the key factor in attaining this is the people. People management is therefore very essential and an organisation that fails to manage the performance of its employees undermines its competitiveness and subsequent survival," he said. 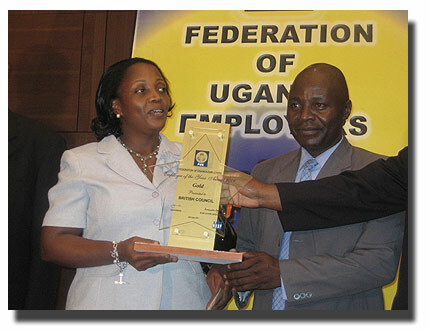 In July 2006, the Federation of Uganda Employers reviewed its earlier approach and the methodology it used to conduct the Employer of the Year Award survey. The main outcomes of the review included a new methodology for conducting the survey in a more elaborate and sustainable manner along with the introduction of a panel of judges composed of highly distinguished, independent and respected personalities to be involved in the selection of the winners. Others changes were the introduction of the Platinum Award as the overall winner's award and the possibility of more than one organization winning the Gold, Silver and Bronze depending on the findings of the survey. According to the Federation of Uganda Employers chief, the new methodology focused on employee perception and involved administering a self-completed questionnaire to the selected number of employees from each participating organization. "It is the federation's belief that people, who are the most important assets of an organization, are in a better position to tell the extent to which human resource policies and practices are effective in creating an enabling environment that motivates them to work towards the achievement of the organization's business strategy," he said. Kasekende added that the pioneer organizations under this new methodology will go down in the annals of Uganda's history for the major contributions they are making in improving the human resource function in the country. Guests at the 6th Employer of the Year Award ceremony. Jude Bukenya is a senior political and business reporter with Ultimate Media Consult (U) Ltd.